One of the directions we're seeing a lot of deck builders move towards this year is skipping the builder and becoming a DIY superstar. A great way to reduce your overall cost, take more pride in your project, and learn a new skill is to create the outdoor space your family will love all on your own. For deck building that has meant a large shift towards prefabricated panel railing systems. Arriving to your door in preassembled, ready-to-mount sections; these metal railing systems almost couldn't have a quicker installation time. Simply mount your posts in place, attach brackets, fasten your railing panels; and you're finished. No tiny bits and pieces. No extra hassle necessary. Just a completed, and code-compliant deck railing that will help your space become the most popular in the neighborhood. 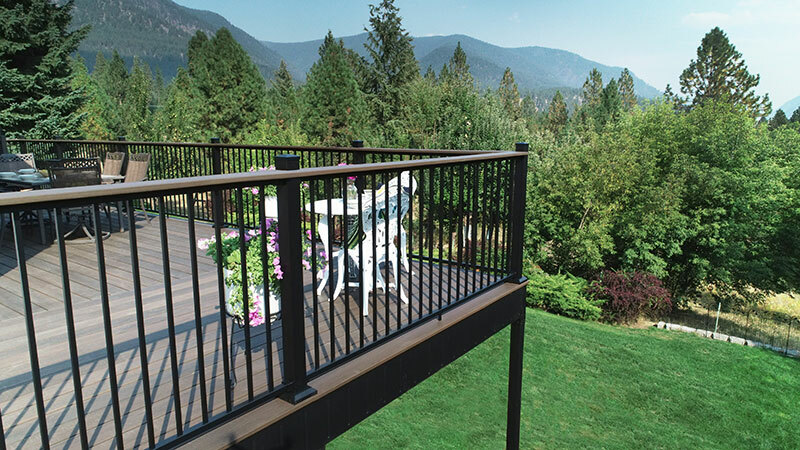 Completing your deck railing project has never been simpler than with the all-new AL13 Home Panel railing system from Fortress. Featuring posts with pre-installed mounting brackets to suit either a standard 36 inch or 42 inch railing height, the AL13 Home system can essentially be installed in two simple steps. The pre-welded aluminum panel arrives to your door ready to be installed and boasts thin, black balusters for a rattle-free infill that truly opens up your view. Give your railing panels an elegant, finished look with the gently curved Round or modern Flat Accent Top Rails offered in 6 foot, 8 foot, and 16 foot lengths. To add a timeless look to your outdoor space in almost no time at all, check out the FE26 Steel Panel Railing system by Fortress. Blending the modern security and strength of galvanized and powder-coated steel with the classic look of wrought-iron railing; the FE26 system can highlight and protect your home all in one. Both attractive and affordable, Wild Hog Railing panels offer a unique infill option that blends well with wood, composite, or metal posts and rails. Available in both Welded Mesh and Woven Mesh, these infill pieces are made from 6-gauge steel and are fortified, zinc-primed, and powder-coated for long-lasting looks. With a sleek, anodized finish the ALX Contemporary Aluminum Railing system by Deckorators looks ultra-modern and complicated but installs like a dream. These weather-resistant aluminum panels feature either square or round balusters and can create a 36 inch or 42 inch standard railing height easily. Once your deck layout and railing plan is ready, start planning on which panel system suits your home's style the best! Working with a panel system means you can be fully installed within the afternoon, so you can spend less time working on your deck and more time enjoying it. If at any point in your project you have any questions, feel free to give our deck experts a call at 1-888-824-5316 or send us an email at hello@decksdirect.com.